Israeli artist Dorit Jordan Dotan will be an exhibitor in a group show in Berlin, Germany at the The Verein Berliner Künstler (VBK / Berlin Artist Association). Opening July 8, 2015. This exhibition celebrates 50 years of friendship between Israel & Germany, with the support of the Israeli Foreign Ministry – Art and Culture Department. The Israeli curator and artist Aviva Shemer lost her entire family during WWII, except a grandfather who came to Israel. One day a stranger came – a survivor who brought photos of her lost relatives. From these, she began a series of photographs, paintings and sculptures titled, “Memory of the Future”. Her central question: how to continue living one’s life – creating one’s future – with such past memories? Her answer was to create “tikkun” (repairing the world). The Jewish way to deal with evil is to heal it, by bringing it into the light. Between Germany and Israel, the relationship is both political and historical. Politics and history have created complex barriers which challenge German and Israeli artists to take the initiative to overcome these formidable obstacles – with the goal of not ignoring these challenges, but of transforming them into opportunities for mutual cultural enrichment. This creates an exciting opportunity for artists to explore both our differences and our shared similarities, historical, political, and cultural. 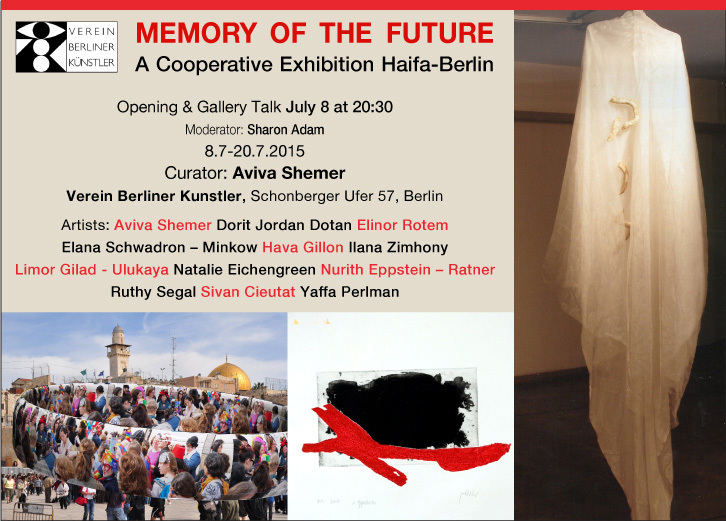 Images credit: Dorit Jordan Dotan, Aviva Shemer, Nurit Eppstein.